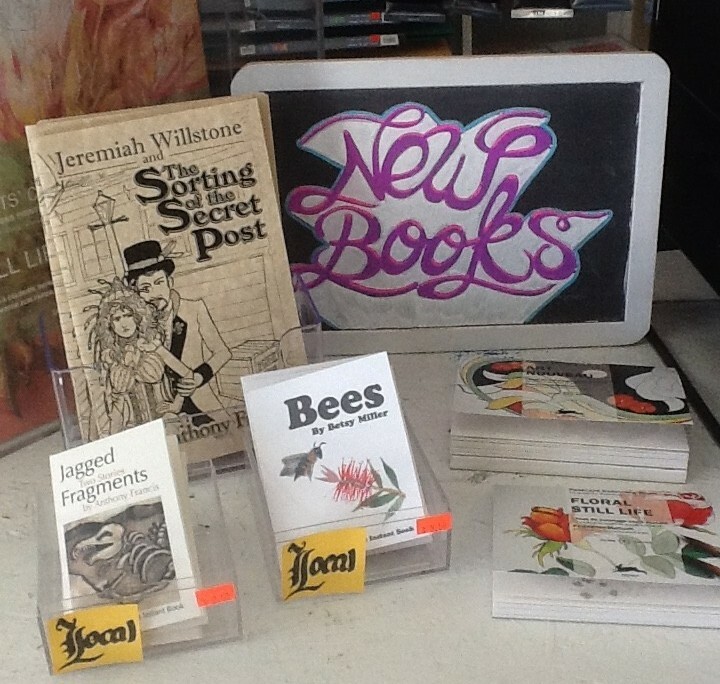 The Arsenal, an artist-owned art store in San Jose, CA, now has a display of our Instant Books: Bees by Betsy Miller, and Jagged Fragments and Jeremiah Willstone and the Sorting of the Secret Post. Stop by if you’d like to buy copies and support a local art shop! 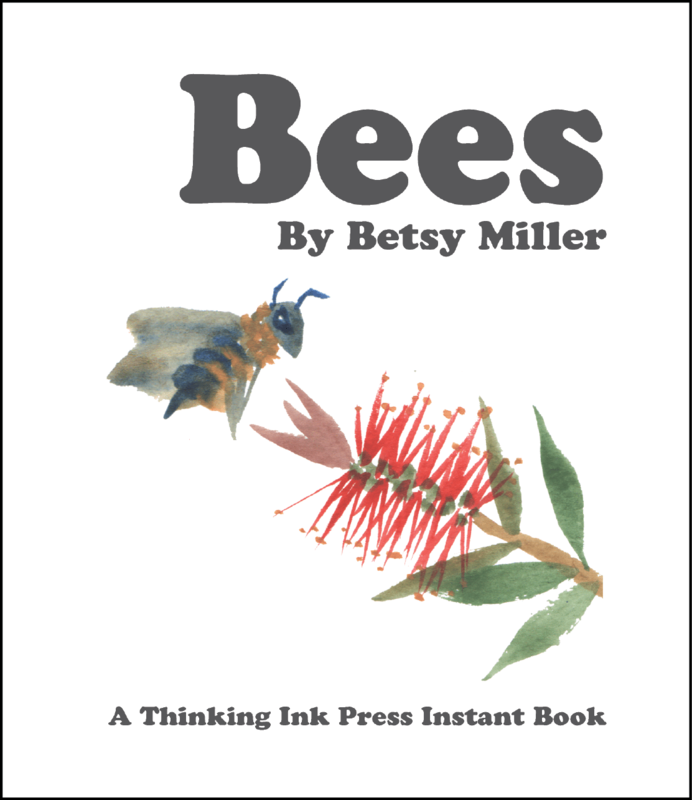 Thinking Ink Press is happy to announce a new instant book: Bees by Betsy Miller. He was not so afraid of bees that he couldn’t leave the house. It was more like if he saw a bee he would avoid it, you know, walk the other way. He knew all the places where bees liked to go on the way to school—the bottle brush plant, which he called the bee tree was worst of all. He always made sure to cross the street to the opposite side to avoid the bee tree. Instant books are limited edition miniature books with complete stories inside. They fit in the palm of your hand, but are sturdy enough to read and share. Keiko O’Leary, our Instant Book designer, created this book layout. She selected the typography and paper, created the cover art, and hand-folded each book. Bees was released at the June 3rd Play On Words event at Café Stritch, where “Bees” was performed and Instant Books were available for purchase. Successful Outcome for The Parents’ Guide to Perthes Preordering and Crowdfunding Event! We’re very happy with the results of the preordering and crowdfunding event for The Parents’ Guide to Perthes. Thank you to everyone who contributed. Not only did people order books for themselves, but contributors also covered the cost for us to donate over 20 books. We’ll be working with nonprofit organizations and hospitals where Perthes is treated so that the donated books will find their way into good hands. We are currently getting The Parents’ Guide to Perthes ready for publication in paperback and e-book editions and expect to have books available in February 2015. We’ll follow up with contributors as soon as we have books. When The Parents’ Guide to Perthes is published, it will go into world-wide distribution through online booksellers and brick and mortar bookstores. ETA May 18: Since you can now buy the paperback through most booksellers, we’re no longer accepting preorders through our website. Thinking Ink Press is excited to announce that we will be publishing The Parents’ Guide to Perthes, the first book about Perthes disease for families. Perthes is a rare childhood disease that affects the hip joints of children age two to twelve years old and can limit the child’s mobility. Written by Dr. Charles T. Price and Betsy Miller, The Parents’ Guide to Perthes provides accurate information and practical advice for families. Charles T. Price, MD is a pediatric orthopedic surgeon. He has done research on Perthes and has shared his findings in research papers and medical books. Betsy Miller is the author of The Parents’ Guide to Hip Dysplasia and The Parents’ Guide to Clubfoot (available through booksellers). People affected by rare diseases need resources as much as anyone else. But publishing books about rare diseases is challenging because the number of potential readers is small. The cost of publishing the book is more than the amount of income that book sales can generate. Thinking Ink Press is looking for ways to make it possible to publish The Parents’ Guide to Perthes and other similar books. To that end we’re running a pre-ordering and crowdfunding event on Pubslush from October 17, 2014 through November 16, 2014. Please visit the project page on Pubslush, at http://perthes.pubslush.com, to learn more about the project and to download an excerpt.